MILWAUKEE — The tables did not turn for the Arizona Diamondbacks in Milwaukee. Travis Shaw hit a three-run homer and Jesus Aguilar had a go-ahead, two-run single during a seven-run fourth inning to help the Brewers beat Arizona 9-2 Wednesday and send the Diamondbacks to their seventh straight loss. Brent Suter (4-3) allowed two runs and four hits in 5 2/3 innings as the NL Central-leading Brewers moved a season-high 12 games over .500. Milwaukee’s 31-19 start is the team’s best over 50 games in franchise history. Arizona has lost a season-high seven straight games — its longest skid since September 2014. The Diamondbacks have fallen from the NL West lead while losing 13 of 14 and scoring just 26 runs in that span. The three straight losses to Milwaukee marked the Brewers’ first sweep of the Diamondbacks since June 2-4, 2008. Suter allowed solo home runs by Goldschmidt and John Ryan Murphy in the second inning in his first start against the Diamondbacks. “We’re going to have to play better,” Goldschmidt said. That’s exactly what Lovullo wants to see. When it doesn’t happen, he tries to stay calm — at least most of the time. Arizona had just 10 hits in the three-game series. Zack Godley (4-4) gave up a season-high eight runs — six earned — and seven hits in 3 1/3 innings. He struck out three and tied his season high for the fourth time this season with six walks. Goldschmidt is hitting .420 (37 for 88) with 10 doubles, eight home runs and 21 RBIs in 23 games at Miller Park. Arizona’s Socrates Brito was 0 for 3 in his first major league appearance since Oct. 2, 2016. When he bunted down the first(equals)base line in the fourth, Suter sprang off the mound, fielded the ball with his bare hand and flipped it to Jesus Aguilar at first. Suter completed the play tumbling head over heels. OF Jarrod Dyson got a day off. “It’s hard to take Jarrod out of the lineup, but he needs rest,” Lovullo said. Dyson is hitting .387 in his last 11 games. 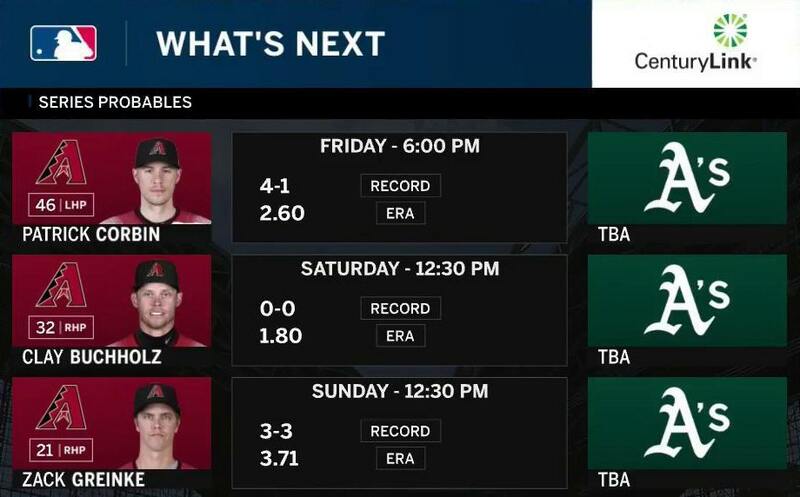 Diamondbacks LHP Patrick Corbin (4-1, 2.60 ERA) makes a road start at Oakland on Friday night in the opener of a weekend interleague series.